There is only one solution that comes from the ache of seeing iceboats ripping around on Mona Lake all your life: give in and buy one. If the thrill doesn’t quite meet expectations, build one that will be faster. Pat Filius has lived 20 years on a now-flooded celery flat fed by Black Creek, the main tributary of Mona Lake in Norton, Michigan. In 2014 he bought his first iceboat for $400. Sailing it just once was enough to convince him that he wanted a faster boat. He found a website for the Mini Skeeter, a small craft that John Enslore designed to be sailed over land or ice. 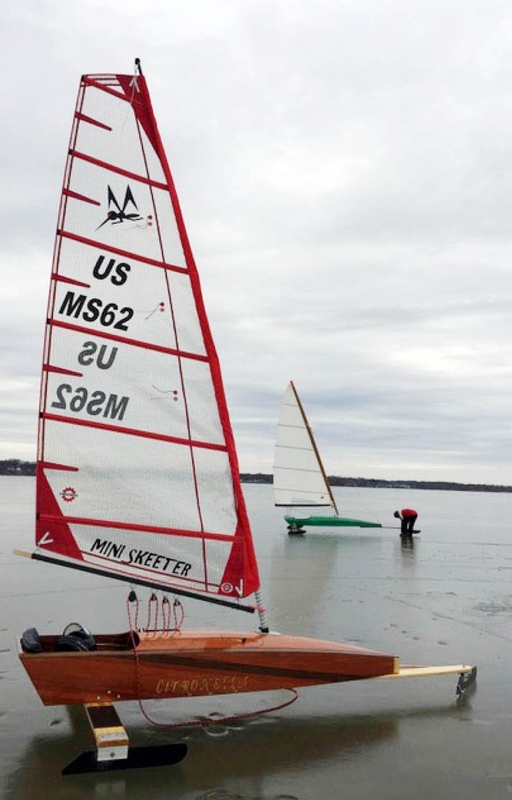 He didn’t know any ice boaters at the time but found his way into a new group of friends at WMIYC.org. 45-year-old Filius went “All in!” as they say in Texas Hold ‘Em poker. So far, he has spent $8,000: half on components, boat building materials, and supplies, and half on a trailer to haul it. He also spent $50 to buy plans. Filius bought the spars, a sail, and wheels. He recycled scrap redwood and bought a walnut board and milled strips. He used 1.5 gallons of WEST SYSTEM Epoxy Resin and hardeners in addition to fillers, and S-glass fiberglass cloth. While the plans called for marine plywood for the sides and bottom, he prefers stripper construction. “Strips are pretty,” he said. An access hatch for a beer trunk was a needed deviation from the plans. He’d previously cold molded two wood-strip paddleboards and a kayak with WEST SYSTEM Epoxy. The experienced boat builder and building contractor of new homes knew exactly what he was getting into. “I had fun building it,” he said. Inside a new double-bottomed 7’x7’x14′-cargo trailer, he built a workbench that can be utilized as a bar. He also has 150 lbs of iceboat gear, another plank, and wheels for the land sailing configuration inside this 2,200 lb trailer. To make space in his shed, he mounted the land and ice sailing apparatus on a wall. This leaves room to spare for his ice fishing gear, as well as warm weather gear. The land sailor wheels double as a dolly to portage his Mini Skeeter. It only takes ten minutes from the time he drops the tailgate until he’s ready to shove off. He packs it up just as fast. Filius has an understanding and cooperative family. His wife of more than 25 years, Gerri, would prefer to park her summer convertible in the garage, but accepts that it will always be Pat’s workshop. His daughter, Lyndi, named the boat Citronella, like the mosquito repellent because she thought it would be a cool name for a Skeeter iceboat. Always hitched and ready to roll, he sails every chance he can. His GPS logged 480 sailing miles this season. “It’s so much fun it’s ridiculous!” Filius said. When he began the project, Filius had no idea that long-time WMIYC club member Marty Fredericksen had already built a Mini Skeeter. Noticing that he was slow, Fredericksen invited him over to his workshop to adjust runner alignment. Getting the runners parallel boosted his speed. They agree the Mini Skeeter is comfortable to sail, and fast. Fredericksen had his boat up to 56 mph. “But it doesn’t point,” Fredericksen said. The boat has a self-supporting carbon fiber mast. During the offseason, he plans to build tooling for molding a stiffer mast that will have better upwind performance. The Mini Skeeter is about the same amount of work to build as a DN iceboat, Fredericksen said. 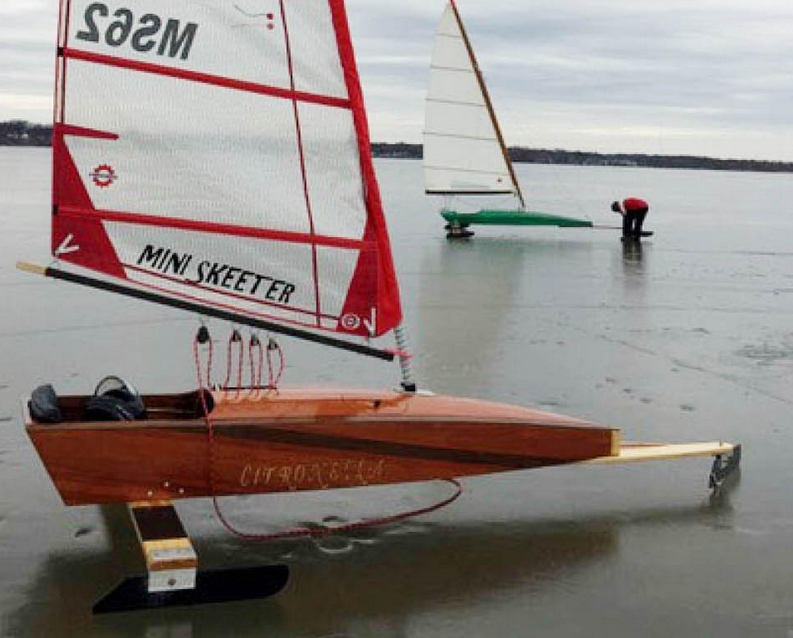 This entry was posted in Boat Repair, Iceboats, Modifying and Customizing and tagged #47, Epoxyworks #47, Mini Skeeter, Randy Rogoski on September 25, 2018 by ewadmin.